Frequently Asked Questions about Vertical Balers and Compactors. Didn't find an answer to your question or do you need more specific information about PTR's product line? Click below to email your questions to our team and receive a prompt response. 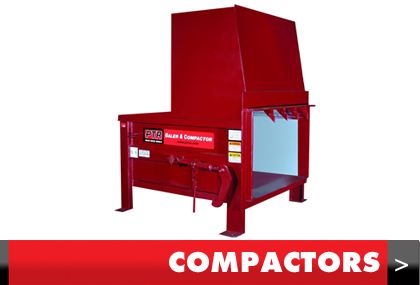 Below are frequently asked questions about PTR's Balers and Compactors. 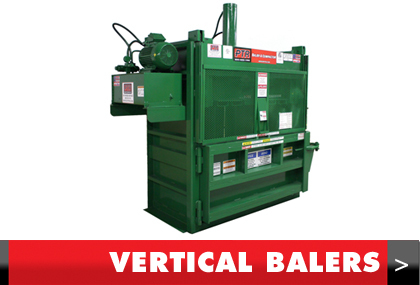 Learn about vertical baler installation, operation and maintaining your baler. Learn the differene between dry waste and wet waste compactors. To browse PTR's product line click here for Vertical Balers or here for Compactors. A vertical baler is a machine used to compress cardboard, plastic, metal, shrink wrap and carpet scraps into compact rectangular bales for the purpose of recycling these materials. Other applications include clothing bales used to ship donated clothing to other countries to help the under privileged. Why do I need a vertical baler when I already have a compactor or dumpster? Recycled materials are a commodity that can be sold. Each bale of cardboard, plastic, aluminum cans or shrink wrap will generate revenue for your organization. Non-recycled materials cost you money to remove and should be reduced to a minimal amount. The weight of the trash collected combined with the number of times the trash is picked up for removal will be billed to your organization. By removing recycled content from your waste stream, you lower the weight and frequency of the trash being removed, lowering your waste removal cost as well as providing a revenue stream in the form of recycled commodities, which can be sold through the recycling market. What model baler would best meet my needs? Different models of vertical balers are used for different types of recycling streams and can vary based on each customer’s needs and volume. Contact a PTR waste stream specialist in order to maximize your waste stream revenue. How do I install a vertical baler? Installation should only be performed by a licensed professional. PTR provides a turnkey installation solution. Our team of experienced installation experts will survey your site to insure the proper fit to your site layout and then schedule the delivery and installation of your unit at a time that is convenient to you. Do I need training to operate a baler? You must be 18 years old or older to operate a baler. During the installation process, our installers will instruct you on how to operate your baler. Each baler also comes with an instructional operating video shipped with the unit and can be found on YouTube or our website. How do I maintain my vertical baler in proper operating condition? Our vertical balers are designed for many years of trouble free operation and come with a standard one year parts and labor warranty. Preventative maintenance programs are available in order to keep your machine running at maximum performance over the life of the machine. PTR also offers nationwide repair services for all makes and models of vertical balers. Are PTR's vertical balers hydraulic? Yes, they are hydraulic powered. Are all of PTR's vertical balers suitable for baling cardboard? Some models like the 2300HD are specifically designed for cardboard recycling. Each model is designed for specific bale sizes and recycling commodities, such as, plastics, shrink wrap, textiles, aluminum cans and scrap metal. Can PTR's vertical balers help with my recycling needs and requirements? PTR’s vertical recycling balers are designed to accommodate various recycling commodities found in typical waste streams. PTR currently works with Retailers, Distribution Centers, Hospitals, waste Haulers, apartment complexes, property management companies, educational facilities and many other industries to provide waste stream diversion options such as our vertical hydraulic recycling baler. A compactor is a machine used to compress waste material in order to reduce the number of times a waste hauler must pick up and empty your waste container. By reducing the frequency of waste pickups, you can reduce the amount of pickup fees that you must pay to your waste hauler. What types of waste can be put into a compactor? Typically, there are two distinct characteristics of materials that could be disposed of into an industrial waste compactor; wet waste and dry waste. Dry waste consists of things such as paper, plastic and textiles that are not able to be removed from the waste stream and recycled. Wet waste includes materials such as food wastes, typically produced in grocery stores, cafeterias or other industrial markets. Which compactor should I choose if I only produce dry waste? A stationary compactor handles dry waste. This unit is mounted to the ground and a waste container is attached to the unit. When the waste container is full, a waste hauler removes the can containing the waste, leaving the compactor behind. The waste container is then emptied and brought back to your location. Which compactor should I choose if I produce Wet waste or a mix of wet and dry waste? Wet waste must be stored in a water tight unit called a self-contained compactor. These units allow the wet waste and any liquids to be collected within the self-contained compactor without spillage. When these units are full, a waste hauler will remove the entire unit, including the liquids contained within, and return the empty unit to your location. How do I install my compactor?